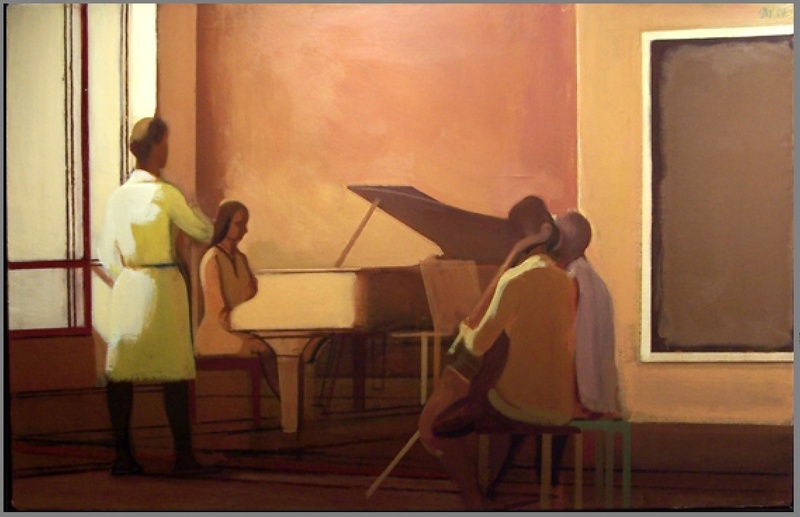 James Weeks (1922-1998) was a figure in the Bay Area Figurative movement in the ’50s and ’60s. His work tended to be strong in color but more reserved and pictorially conventional than that of his confreres. This piece is a favorite. The figures and objects in it are descriptive but refined to simple shapes. These appear again and again so that the ensemble grows increasingly complex the longer one looks. Take the stool shapes on the right–we find them again in the music stands, the piano legs, the piano stool; and then in the linear shapes of similar width in the window, the floor, and the blackboard on the right. The rigor of those rectilinear shapes plays against the softer shapes of the figures. The busyness of the floor and figures plays against the large, simple shapes of window, walls, and piano. The light side of the cellist’s left arm draws the light tone of the walls down into the darker bottom third of the composition. It’s the only shape in the painting that swoops and changes direction. The effect of all these devices and their balancing is a sense of stillness–a very active stillness.